Physicists tell us that thoughts, like everything else in the universe, are a form of energy. The more we dwell on something, the more energy we give it, and this energy spills out of us and into the world. 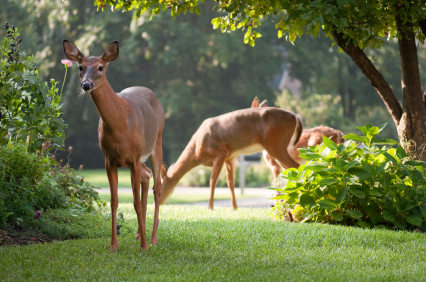 Yesterday I happened to see a deer and two fawns munching my agapanthus buds. I kept very still behind the window, and they did not know they were being watched. Eventually they moved off, carefully, gracefully, looking this way and that, before trotting across the street and disappearing into whatever hidden pockets they came from. It’s a miracle they are managing to find places to give birth, considering all the space we have taken from them. I regard my agapanthus flowers as an apology: the deer can have all they want. And then there are the baby katydids I find each year on the leaves of my lilac bush. There is just a handful of them, and they don’t eat much, certainly no more than they need, and before I have time to adequately admire their miniature beauty, they are gone. In my collection SURVIVAL SKILLS, I explore the ways in which humans and the natural world intersect. If thought is a form of subtle energy, maybe animals, with their heightened senses, can tune into it. Maybe the deer I watch from my living room can feel my unceasing praise, and maybe this admiration strengthens them, the way love profits everything. Oh Jean, I love this! The more I think about and observe my “creatures”, the more energy I generate for every one of them. What a happy thought! Thank you! So lovely. So sensitive. Such wonderful writing. Susan, I appreciate your kind words, as always, and miss you more than you know. Kind of you to comment. Thank you, Gator Woman.